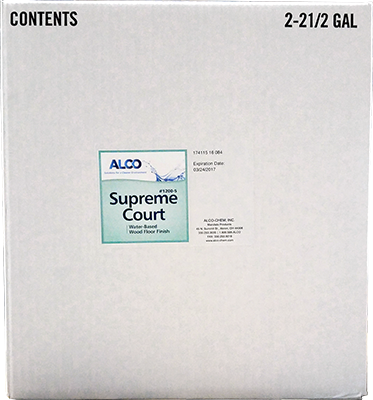 Supreme Court - Alco-Chem, Inc.
Supreme Court Gym Floor Finish is an excellent water-based acrylic/urethane wood floor finish that provides long lasting beauty and protection to all wood floors. Single component formula - there is no catalyst required. Dry time is 1 hour between coats and only 24 hours gym downtime under normal conditions. Meets ASTM D2047 method for slip resistance. Covers up to 1000 square feet per gallon! This is a lower cost alternative to two-part component finishes, but should be burnished monthly. For best results, use with ​Clean ‘n Shine Cleaner & Restorer.